August 27, 2015 was supposed to be another day in training for Trooper J.J Finney and his supervising Trooper, Brian Conaghan. That soon changed as the two got involved in a high-speed chase with Brandon Wooten, 40. With speeds often topping 100 miles per hour, the chase involved several agencies and lasted more than an hour, spanning Payne, Pawnee, and Noble counties. 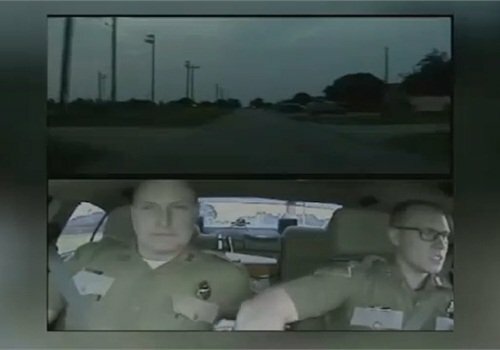 About 13 minutes into the video, you can see Troopers Finney and Conaghan get out of the vehicle and draw their weapons. You can hear both troopers yell at Wooten to stop as he races toward them, before you hear several shots fired in Wooten's direction. According to the probable cause affidavit, Wooten ran off the road and hit a barbed wire fence. Noticing he was shot, the troopers then began to render aid. Wooten would spend four days in the hospital before being booked into the Noble County Jail. He bonded out just 10 days later, posting 10% of his $75,000 bond. Facing four felonies and one misdemeanor, he's due in court again on Oct. 21, OKC Fox TV reports. As of Friday afternoon, Trooper Finney has returned to duty, but Trooper Conaghan is still on administrative leave.